Alison did an amazing job and matched up all the Sockapal-2-zers. I received the information on mine and I am bursting with ideas!!! Can't wait to start! Want to see me thinking hard? Here you go. So I was meditating over my blue anklets. May I introduce? Pattern: based on my very own "everyday" sock pattern. Overall I like how they turned out. But the colour... Don't get me wrong, but first I am not a blue type at all. Unfortunately, the sock yarn stocks in Iceland are very poor. And I have to admit that I cannot really recall/explain, how three (!) of these 50g skeins ended up in my stash. Three... That's why I decided for anklets to give the colour a first tryout before deciding what to do with the other two skeins. Hmm.. I don't really like the "Ringel". 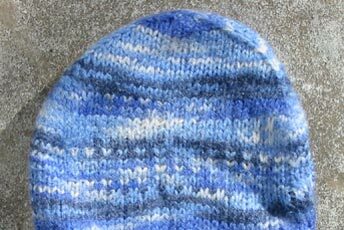 I have another pair in the clown colours that variegates nicely, but the blue is rather blurry but striped. Looks okay with jeans, but I am not overexcited. But one big plus: They've been taken to some extensive test walking now and have proven me right. 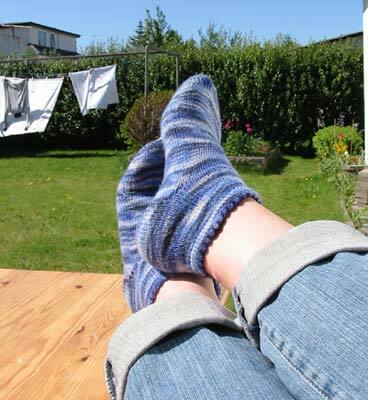 I'd learned from some German knitting blog (forgot where, if you recognize yourself please comment, I am not at all for plagiarism) that it makes socks lasting longer if you knit the sole double. I had no idea really what this meant until I made the heel flap for the Retro-Rib sock and then it made klick. Of course I had to work the slip and knit pattern in the round. Also, for a start I only supported the common danger zone of my socks. Meaning only 30 rows in this style. Honestly, it really adds a creepy look to the sock but only before wearing it for the first time. The structure immediately flattend out (no wonder, stepping on it!) and until now proves to be comfy and strong. I will soon finish another pair of anklets with a fully worked sole for further research. by Carola at 3:13 e.h.